In 2003, Mark Berghorn started the local HealthWear while he was employed at Schapiro’s Uniform Rental. 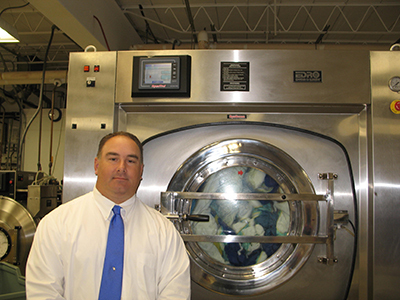 In 2005, the company restructured, and with almost 20 years of laundry and dry cleaning experience, two kids, a good line of credit, and a wife 7 months pregnant with twins, Mark started Healthwear Rental, Inc.
For a few months, Healthwear rented space in the old Schapiro’s Uniform Rental building, while Mark worked at night getting the new location ready. In November of 2005, Healthwear Rental moved into its current space at 703 North Street. The original layout included 4 secondhand washing machines (only 3 worked) and 3 secondhand dryers. 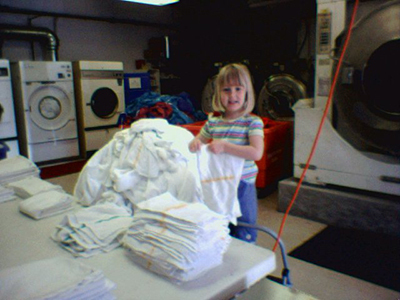 A second hand press and ironer were also installed. The original layout consisted of just under 2,000 square feet. At the time, Healthwear had one van with one service person to work with all of their customers. Through a combination of faith and hard work, loyal customers, dedicated employees, and many blessings, HealthWear grew to a point where they had outgrown their space. During this time, all of the old second hand equipment had been upgraded to new equipment. 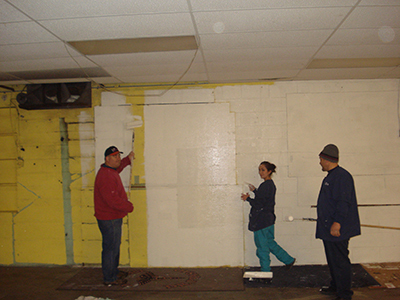 In 2009, the neighboring business behind Healthwear closed, and after a lot of painting and cleaning, HealthWear Rental, Inc. expanded into the vacant space. In late 2009, Healthwear Rental won a New York State award during Disability Awareness month, in recognition for leadership in workforce development that has increased employment opportunities for individuals with disabilities. In 2011, HealthWear Rental survived the flood in Endicott with no service interruptions. Today, Healthwear Rental is able to service the Southern Tier of NY, along with Central New York and Northern Pennsylvania with four delivery vehicles, a dedicated staff, and the same vision of faith and dedicated customer service that has allowed their growth from their humble beginnings. HealthWear Rental is very active in the local community. Healthwear supports the local PBA, local organizations, and sponsors athletic teams in the NTYL. HealthWear Rental is also a supporter of ACHIEVE in Binghamton. Healthwear Rental is a member of the Greater Binghamton Chamber of Commerce and a member of NFIB. Mark continues to be active in his local church, has spent many years coaching youth teams in baseball, softball and basketball, and has served on various committees for the local United Way agency.